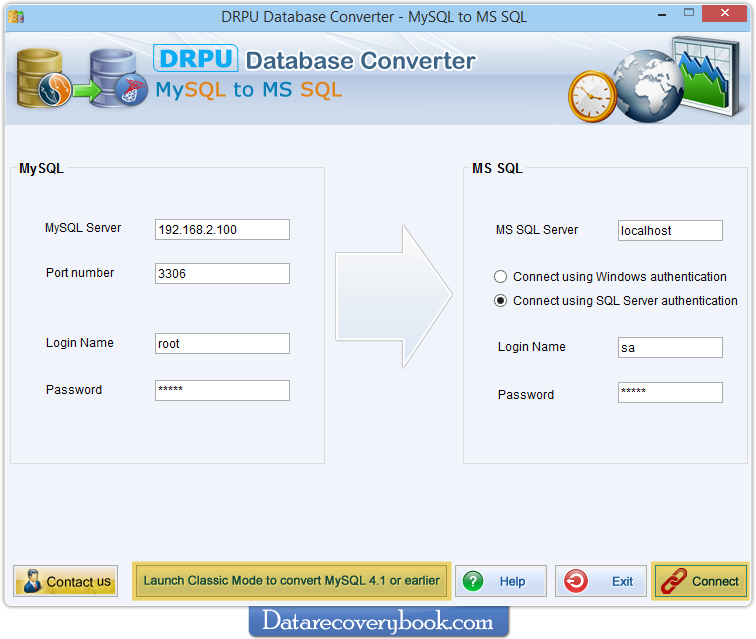 MySQL to MSSQL Database Converter is a program that migrates entire or selected MySQL database records in to MSSQL database. Software provide option to convert views, indexes with all necessary attributes. You can connect MySQL and MSSQL Database server locally or remotely. Database converter tool provides "Classic Mode" option to convert 4.1 or earlier version of MySQL server. Enter all required fields to set up connection between MySQL and MSSQL using Windows authentication or SQL server authentication. Converter tool is compatible with all versions of MySQL server and provides full install/uninstall support on Microsoft windows operating system. All major MySQL data types and attributes are supported by the software. Software provides an option to save the converted Microsoft SQL database records at user defined location. provide option to convert views, Indexes. 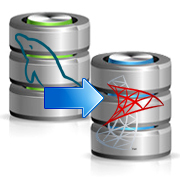 Easily converts entire or selected database record of MySQL to MSSQL database. Software overwrites the converted database of MySQL with existing database of MSSQL server or saves the converted database at user specified location. Supports all the Null values, Key Constraints, Data Types, Schemas, Attributes, Tables, Rows, etc. while performing database conversion. Software maintains integrity of source MySQL database files during conversion into MSSQL database file format. Software is fully functional with all major versions of MySQL database server. User friendly utility is time-saving, reliable and easy to use that automatically converts the MySQL database records.